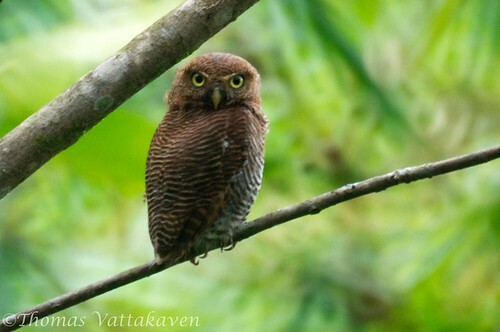 I had posted earlier about the Barred-Jungle Owlet. 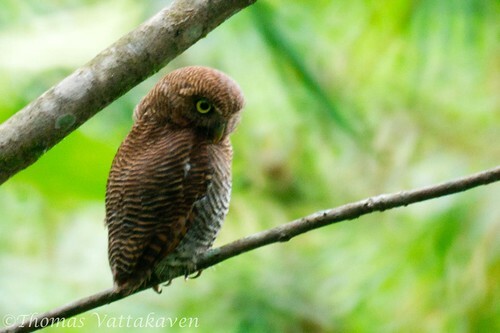 Although these birds are predominantly active by night, they can be seen in shaded areas, roosting during the day. However, they are by no means caught off guard during the day. They remain ever vigilant and can be quite wary of humans. 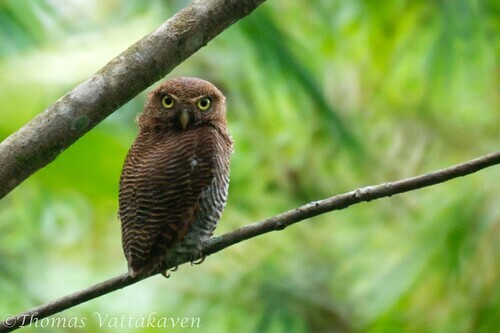 The combination of this alertness and its preference for shaded areas make it less than friendly to photograph. I got lucky with this fellow, who seemed to be comfortable posing for me as long as I kept a safe distance from him. When I attempted to move in closer, it would have none of that and flew to safety. Taken with My Sony A550 DSLR camera with a Minolta 500mm F8 lens.